I’m really excited to be handing over my blog to Lucinda a.k.a. The Nature Doc this week. A series of events, some might call coincidence, (but I don’t believe in it) found me sitting one day in Lucinda’s consultation room. Little did I know that, that simple appointment would change my life and health. I have to admit I was a little sceptical about going to see a Naturopath, and was expecting to be met by an older, hippie type lady who would recommend various lotions and potions. Boy was I wrong. Instead I found (perhaps for the first time in my life) a Doctor who wanted to know the WHY and WHAT behind my illness, with evidence rather than interpretation. 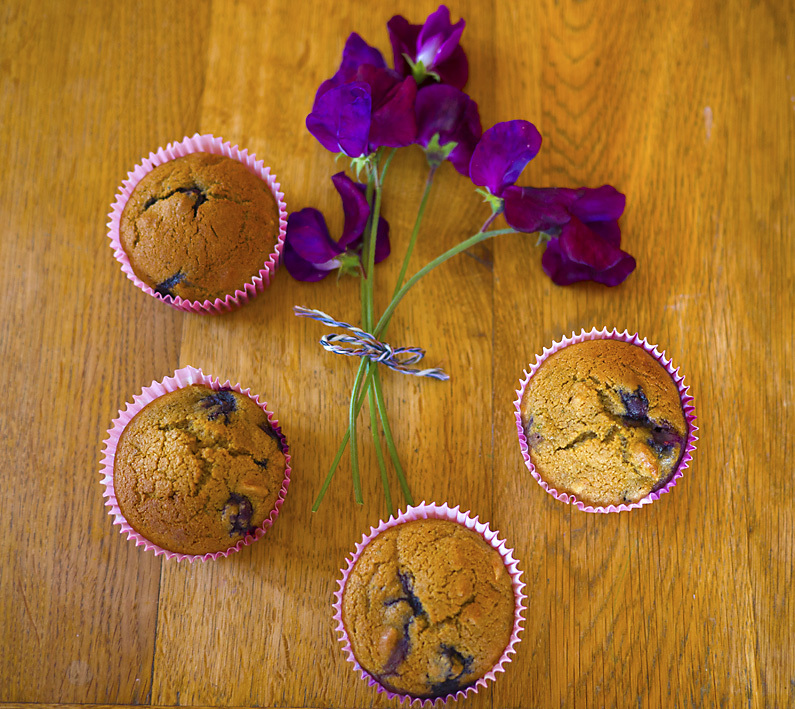 So let me hand you over to Lucinda to properly introduce herself and share with you her recipe for her delicious Breakfast Blueberry and Lemon Muffins. Hi my name is Lucinda Miller, and I am also known as The NatureDoc. I have been practicing as a naturopath for around 20 years and have become more focused as a children’s wellness expert for the past 14 years. I live in Wiltshire, on the edge of Salisbury Plain with my husband, my three children and a spaniel puppy called Pepper. Going wheat and dairy free when I was 25 was one of the best things I have ever done. Within 10 days of changing my diet, my energy levels were rebooted, brain fog cleared and my ongoing gut issues much improved. It was amazing to get through a day without needing a nap – I had needed 4 naps every day for years prior to this! I have also been gluten free for the past few years, as I was also starting to find rye and oats a real challenge, and I discovered that I have the coeliac HLA DQ gene. Since going gluten free I have also been able to tolerate dairy much better and we tend to keep goat, sheep and buffalo products in the house. I am a total foodie and love delving into recipe books and blogs. I love to try out new foods and will drag my family across the country to go to food fairs and festivals at weekends. We love to experiment with food at home, and I try to supercharge meals with a sprinkle of this and that, to keep everyone in good health. This means we rarely eat the same meal twice, however I do also get special requests from the children for old favourites such as spag bol, shepherd’s pie and kedgeree. I love the variety of flavours from different cultures and fusion food has always been very inspiring to me. I studied anthropology at university, and spent quite a lot of time travelling in my late teens and early 20’s. I adore bowls of food and love to eat different combinations from steaming Thai noodles with prawns and pak choi to Acai bowls to Buddha bowls. I have the best job in the world and am very lucky to work with such a diverse range of families, all with the common belief that the wrong diet, gut bugs or a toxic environment are the root cause of their child’s health issues. I am one of the few practitioners that specialise in children’s health in the UK and I run clinics in London and Stockbridge, Hampshire. I advise on how to optimise a child’s health and one of the most important things you can do is to cook from scratch and avoid processed foods. I am seen as quite a “techie” naturopath in that I do like to work from an evidence based platform. I am very anti removing food groups from a child’s diet unless there is a very specific reason. I may well arrange a combination of hair, blood, stool and urine tests and sometimes genetic testing such as 23 and Me, before changing diets or prescribing supplements. Typically in my clinics, I see children with fussy eating habits, sore tummies, food sensitivities, wheezing, scratchy skin, poor sleep, hyperactivity, speech and communication problems, social anxiety and those falling behind at school. I am also increasingly seeing children with auto-immune conditions and many with complex health challenges. We look to see whether food intolerances, poor balance of gut bugs or nutrient deficiencies might be triggering these issues and use specialist diets, food supplements, super foods and herbs to support them. When we get this right, very often their specific issues start to melt away. I always work closely as a team with the parents and I am wowed on a daily basis at the love, hard work and devotion they put in to get their children back on track. Very often little problems when children are small can turn into much bigger problems when they grow older and this is why I passionately believe in giving kids the best health they can, when they are young. I have an incredibly rewarding job and receiving daily messages such as, little George is finally sleeping through the night or that Ethan has started talking or that Anna has received star pupil of the week at school, keeps me going an motivated to help more and more children. I fell behind academically in my teens and therefore in self-confidence (probably due to the gluten!) and I this is what motivates me to make life much easier for as many children as possible. Why would I recommend going gluten and dairy free? Gluten and dairy are two of the main foods that are becoming a major challenge to children and food intolerances are on the up. These foods are both seen as pro-inflammatory and inflammation is now considered the root cause of almost all modern diseases. These foods can also be very difficult to digest. If a child tests positive for gluten or dairy sensitivity then they will need to remove these foods from the diet. Children have an amazing healing potential and often a temporary removal of these foods can give the immune system the break it needs to help it tolerate these foods more in the future. Food intolerances in babies and toddlers often present with colic, reflux, and nasty nappies and may lead to all manner of issues ranging from poor sleep, to lowered immune system to itchy skin. Behaviour and focus can be a major challenge with these children and often they seem behind in their development. Some mums have come to me knowing their child has problems with certain foods and want to expand their diet more and keep them in good health. More often I organise food intolerance tests to include non-coeliac gluten sensitivity and antibody testing for dairy, eggs and other grains for those who need clarification on what foods their child can tolerate. Here is a recipe that seems to be a winner with children and adults alike. These little beauties are gluten free, dairy free with no cane sugar. They are full of brain food goodies such as blueberries, ground almonds and sunflower seeds. The lemon zest gives them a gorgeous bright zingy taste. Lovely and nutrient-dense, these muffins are a fabulous breakfast option. There is a sneaky added ingredient as the mixture contains a whole medium sized courgette! This hides beautifully amongst the other ingredients, so a perfect option for the anti-veg brigade. Also great as an after school snack or in a lunch box (if nuts are allowed). Light and fluffy with just enough sweet, so they do not cause a big sugar spike. Grate the lemons with a nutmeg grater or lemon zester and the courgette with a larger cheese grater. Whisk the eggs and the coconut sugar together for about three minutes with an electric whisk until creamy. Add in the grated courgette and lemon zest and whisk again briefly. Then add the rice flour, ground almonds, baking powder, bicarbonate of soda, and salt and blend in with a spatula to keep nice and fluffy. Place paper muffin cases into 2 x 12 muffin tins and add a small ice-cream scoop of the muffin mixture to each paper case. Place in a 180C degree (350F) oven for 25 minutes until risen and golden brown on top. Lucinda Miller, NatureDoc – Lucinda is the the go-to naturopath for children’s health in the UK. 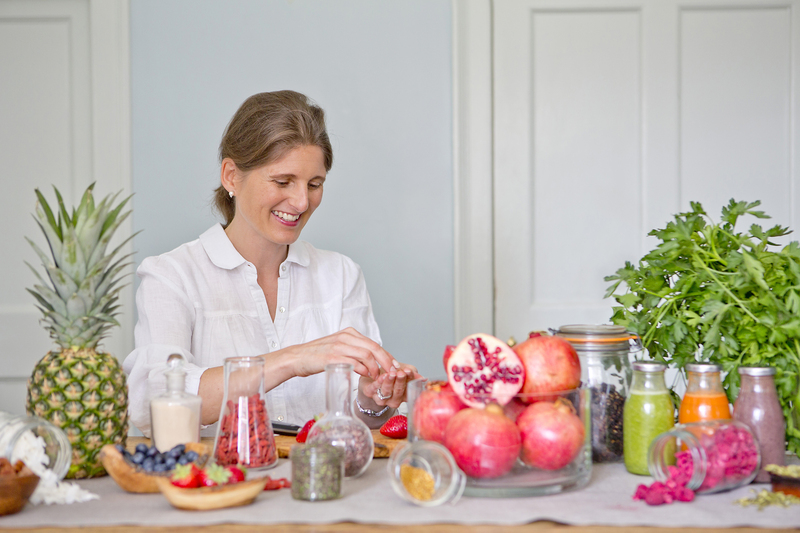 She runs a blog, with simple and effective tips for brighter, happier children, as well as a recipe site, dedicated to delicious and healthy recipes for tricky diets. She is also writing a book. She runs clinics in Sloane Square, London and Stockbridge, Hampshire. Visit Lucinda’s website or call 020 3397 1824 to make a booking. Wonderful post! These muffins look gorgeous!!!! They must be really delicious!